His partner pokemon, Lizardon, is able to Mega Evolve into Mega Lizardon X.
Manon is a novice Trainer who only just started her journey. Her partner pokemon is a Harimaron who always gets her out of trouble that she's nicknamed "Hari-san" (ハリさん). She loves Mega Evolution and is traveling with Alan. Daigo is the Champion of the Houen Region. He is currently doing independent research on where Mega Evolution started. 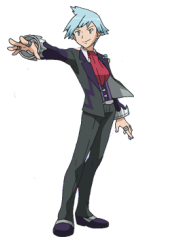 His partner is a differently-colored Metagross. An all-out battle between his Mega Evolved Metagross and Alan's Mega Lizardon X is about to unfold!